(1) 本阿弥眞治，“アクチュエータ空力特性の向上に基づく流れの制御技術の新たな展開”，日本機械学会論文集B編，Vol. 79, No. 808 (2013), pp. 2670-2678. (2) Cattafesta, L.N. and Sheplak, M., “Actuators for Active Flow Control”, Annual Review of Fluid Mechanics, Vol. 43 (2011), pp. 247-272. (6) 横井嘉文，亀本喬司“二次元的な境界層はく離流れに潜在する初期の三次元渦構造（円柱上層流境界層はく離のはく離域からの可視化観測”，日本機械学会論文集B編，Vol. 57, No. 531 (1991), pp. 3273-3277. 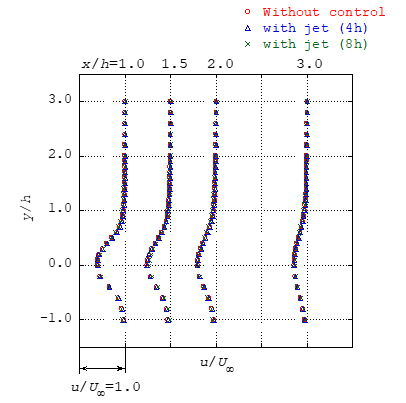 (9) Ho, C.-H. and Huerre, P., “Perturbed free shear layers”, Annual Review of Fluid Mechanics, Vol. 16 (1984), pp. 365-424.